“She is My entire property and wealth. Please accept Her. There is nothing which is more dearest to me than Radharani. “I could not even arrange a suitable husband for my one daughter how can I arrange for two?”. Then Krishna gave gold to the brahmana equal to the weight of Radharani. When Radharani understood that Krishna compared her with “thing”, then she got angry with him. Therefore Krishna realized His mistake and again they relished their sweet pastimes. 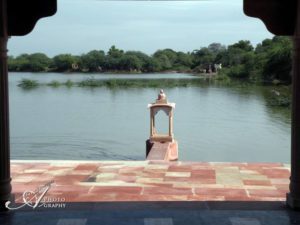 The Deha Kunda is where Sri Krishna gave gold equal to the weight of Radharani to that Brahmana. Deha means body. That is why this place is known as Deha Kunda. 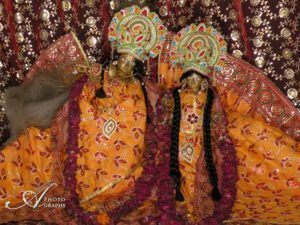 Because of this pastime of donating Srimati Radharani’s weight in gold, there is a temple nearby known as Deh-Bihari Mandira. Here it is believed, it is very auspicious to donate gold at this place. Deha Kunda is located at Uncha gaon and just below Shri Lalita Sakhi’s temple at Uncha Gaon. Uncha Gaon (village) is situated one mile west of Barsana, is the village of Shri Lalita Sakhi. If you are at the bottom of the steps that go up to the Lalita Krishna temple, facing the temple, this kunda is on your left about 60 m (180 feet away). This kunda is next to the Lalita Devi Temple, at the bottom of the hill. Deha means “physical body” and at this place the gopis are said to have physically given everything to Krishna.